by Chris Woodford. Last updated: December 27, 2018. It's just as well fireworks were invented in ancient times, because such an outrageous invention surely wouldn't be allowed in our risk-averse society today. Just imagine if fireworks didn't exist and someone suddenly suggested the idea of allowing people to fire lots of explosives into the air! Fortunately, that's not the case and we can still enjoy the dazzling magic of these psychedelic aerial displays every time we feel like a joyous outdoor celebration. Fireworks teach us some interesting physics and chemistry, so let's take a closer look at what they are and how they work! Photo: A fireworks display at Seattle Seafair. Photo by Douglas G. Morrison courtesy of US Navy. A firework is essentially a missile designed to explode in a very controlled way with bangs and bursts of brightly colored light. The word "firework" comes from the Greek word pyrotechnics, which means, very appropriately, "fire art" or "fire skill"; there's certainly no shortage of art and skill in modern firework displays! Photo: A summer firework display in Swanage, England. A single firework can involve dozens of separate explosions. Stick ("tail"): The first thing you notice is a long wooden or plastic stick protruding from the bottom that ensures the firework shoots in a straight line. That's important for two reasons. First, so that fireworks go where you intend to and don't fly in a random direction, causing fires, property damage, or injuries. Second, because it helps display organizers to position firework effects with accuracy and precision. Some fireworks now have hinged plastic sticks so they can be sold in smaller and more compact boxes. Fuse: This is the part that starts the main part of the firework (the charge) burning and ignites other, smaller fuses that make the interesting, colorful parts of the firework (the effects) explode some time later. In a basic home firework, the main fuse consists of a piece of paper or fabric that you light with a match or cigarette lighter. In a complex public firework display, fuses are lit by electrical contacts known as wirebridge fuseheads. When the firework technician pushes a button, an electric current flows along a wire into the fusehead, making it burn briefly so it ignites the main fuse. Unlike manual ignition, electrical ignition can be done at a considerable distance, so it's much safer. Charge ("motor"): The charge is a relatively crude explosive designed to blast a firework up into the sky, sometimes a distance of several hundred meters (1000ft or so) at a speed of up to several hundred km/miles per hour (as fast as a jet fighter)! It's usually made up of tightly packed, coarse explosive gunpowder (also known as black powder). Traditionally, gunpowder used in fireworks was made of 75 percent potassium nitrate (also called saltpeter) mixed with 15 percent charcoal and 10 percent sulfur; modern fireworks sometimes use other mixtures (such as sulfurless powder with extra potassium nitrate) or other chemicals instead. Note that the charge simply sends the firework high into the air and clear of any spectators; it doesn't make the spectacular explosions you can actually see. Effect: This is the part of the firework that makes the amazing display once the firework is safely high in the air. A single firework will have either one effect or multiple effects, packed into separate compartments, firing off in sequence, ignited by a relatively slow-burning, time-delay fuse working its way upward and ignited by the main fuse. (The firework illustrated here has three effects.) Though essentially just explosives, the effects are quite different from the main charge. Each one is made up of more loosely packed, finer explosive material often fashioned into separate "stars," which make up the small, individual, colorful explosions from a larger firework. Depending on how each effect is made and packed, it can either create a single explosion of stars very quickly or shoot off a large number of mini fireworks in different directions, causing a series of smaller explosions in a breathtaking, predetermined sequence. Head: This is the general name for the top part of the firework containing the effect or effects (collectively known as the payload—much like the load in a space rocket). Sometimes the head has a pointed "nose cone" to make the firework faster and more aerodynamic and improve the chance of it going in a straight line, though many fireworks simply have a blunt end. Science teachers love fireworks because they teach you about chemistry and physics at the same time, in a very dynamic and colorful way! 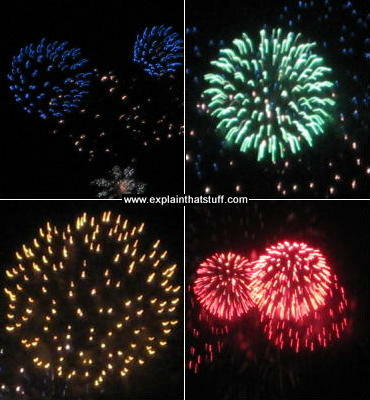 What makes the different colors in fireworks? That's chemistry too! Fireworks get their color from metal compounds (also known as metal salts) packed inside. You probably know that if you burn metals in a hot flame (such as a Bunsen burner in a school laboratory), they glow with very intense colors— that's exactly what's happening in fireworks. Different metal compounds give different colors. Sodium compounds give yellow and orange, for example, copper and barium salts give green or blue, and calcium or strontium make red. Photo: Chemical reactions in the sky: different metal salts make the different colors in firework displays. Clockwise from top left: blue and green = copper or barium; red = calcium or strontium; yellow and white = sodium. The solid chemicals packed into the cardboard case don't simply rearrange themselves into other chemicals: some of the chemical energy locked inside them is converted into four other kinds of energy (heat, light, sound, and the kinetic energy of movement). According to a basic law of physics called the conservation of energy (one of the most important and fundamental scientific laws governing how the universe works), the total chemical energy packed into the firework before it ignites must be the same as the total remaining in it after it explodes, plus the energy released as light, heat, sound, and movement. Physics also explains why a firework shoots into the air. The charge is little more than a missile. As it burns, the firework is powered by action-and-reaction (also known as Newton's third law of motion) in exactly the same way as a space rocket or jet engine. When the powder packed into the charge burns, it gives off hot exhaust gases that fire backward. The force of the exhaust gases firing backward is like the blast coming out from a rocket engine and creates an equal and opposite "reaction" force that sends the firework shooting forward up into the air. If you look at the various firework photos on this page, you'll see another bit of interesting physics going on as well. Notice how fireworks always make symmetrical explosions? If one part of the firework goes left, another part goes to the right. You never see a firework sending all its stars to the left or a bigger series of explosions to the left than to the right: the explosion is always perfectly symmetrical. Why is that? It's because of another basic law of physics called the conservation of momentum: the momentum of a firework (the amount of "stuff moving" in each direction, if you like) must be the same before and after an explosion, so explosions to the left must be exactly balanced by explosions to the right. Surprise and variety are the key to any good firework display: if all the fireworks were exactly the same, people would quickly get bored. Although all fireworks essentially work the same way—combining the power of a missile with the glory of burning metallic compounds—there are lots of different types. The ones we've talked about so far are called rockets or skyrockets and produce the most spectacular displays high in the air. Catherine wheels and pinwheels work closer to the ground. They have a number of small fireworks mounted around the edge of a wooden or cardboard disk and make it spin around as they fire off. Roman candles blow out a series of small fiery explosions from a cylinder every so often. Firecrackers are fireworks designed to produce sound rather than light and they're often incorporated into the upper effects of rockets. We think of fireworks as entertainment, but the same technology has more practical uses. Flares used by military forces and at sea work in almost exactly the same way, though instead of using metallic compounds made from elements such as sodium, they use brighter and more visible compounds based on magnesium and they're designed to burn for much longer. Even in an age of satellite navigation and radar, most ships still carry flares like these as a backup method of signaling distress. Photo: Fireworks began as a military technology and they're still used by the armed forces today. Here, sailors onboard the aircraft carrier USS Ronald Reagan are enjoying a July 4 firework display as they sail through the Western Pacific and Indian Ocean. Photo by Jennifer S. Kimball courtesy of US Navy. Who invented fireworks? Here's our quick history lesson! Chinese people believed to have made explosive rockets in the 6th century CE during the Sung dynasty (960–1279CE). Arabian world acquires rocket technology from the Chinese around 7th century. During the mid 13th century, English monk and pioneering scientist Roger Bacon experiments with the composition and manufacture of gunpowder. Rockets similar to fireworks are used during an invasion of China by Mongolian forces in 1279. The Mongols introduce firework technology to Europe and it spreads during the Middle Ages. Fireworks are produced in Italy around 1540 and spread to England, France, and other European countries the following century. November 5, 1605: Guy Fawkes (1570–1606) attempts to blow up the English houses of parliament with gunpowder buried in the cellar, giving rise to the popular British custom of huge public firework displays on November 5 each year. The custom of using fireworks for elaborate celebrations gains popularity in Europe in the 17th century. Prompted by the need to produce ever more spectacular displays, firework manufacturers introduce new chemicals and more sophisticated ways of packaging them. 20th century: American scientists Robert Hutchings Goddard swaps the solid fuel in fireworks for a liquid fuel system, pioneering modern space rocket technology that ultimately lands men on the Moon in 1969. 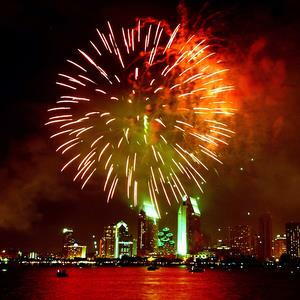 Photo: A 4th July firework celebration in San Diego. Photo by Scott Taylor courtesy of US Navy. Fireworks give joy and pleasure to many millions of people every year, but they have to be treated with utmost respect because they are extremely dangerous. Consider: what you have in a firework is an explosive missile. Get too close to it and it could burn you badly, disfigure you for life, or even kill you. Every year, millions of dollars of damage is done by stray fireworks setting fire to property and there's also the distress that fireworks cause to pets to consider. That's why the sale and use of fireworks is restricted by law in many countries. If you're having anything to do with fireworks, be sure to read and follow all the safety instructions to the letter. Better still, why not leave handling fireworks to someone else? Go to a properly organized and supervised civic display and enjoy all the fun of the fireworks with none of the danger. Safer Fireworks: from the UK's RoSPA (Royal Society for the Prevention of Accidents). The National Safety Council: A good starting place for North American readers. Fireworks Use: Guidance on buying and selling fireworks in Canada from the Canadian Government's website. Anatomy of a firework by Kate Hudec. The PBS NOVA site has a good little interactive feature showing how a firework consists of several different explosive stages. The Chemistry of Fireworks by Michael S. Russell. The Royal Society of Chemistry, 2009. A detailed introduction to the chemistry (and physics) of fireworks, including the principles behind all the main types of firework, sound and lighting effects, safety, and legislation. There's also some history and a useful glossary of pyrotechnic terms. Fireworks: Principles and Practice by Ronald Lancaster. Chemical Publishing Co., 2005. Generally regarded as one of the definitive books for firework professionals, available in various editions since the 1970s. Opens with a history of fireworks and their general chemical and physical principles before considering the various different types in turn. The Pyrotechnist's Treasury: A Guide to Making Fireworks and Pyrotechnics by Thomas Kentish. This classic 19th-century guide to firework-making is available for free, in various ebook formats, from Project Gutenberg. The Explosive Story of Fireworks: History of Fun Stuff by Kama Einhorn. Simon & Schuster, 2015. The invention and development of fireworks in 48 colorful pages, wonderfully illustrated by Daniel Guidera. Suitable for grades 1–3; ages 6–8. Fireworks by Vicki Cobb. Millbrook, 2006. 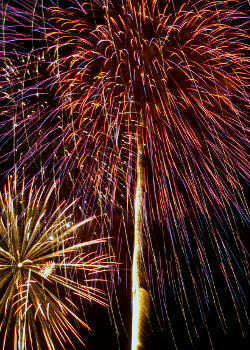 Covers the history and basic science of fireworks for grades 4–6; ages 9–12. Fireworks by Isobel Thomas. Raintree, 2006. A short 32-page introduction to fireworks as examples of chemical reactions, roughly suitable for ages 8–12. A Watcher’s Guide to the New York City Fireworks by Amanda Svachula. The New York Times, July 5, 2018. How do you plan a 75,000-shell display that will do justice to one of the world's greatest cities? A History of Fireworks Mayhem on the Fourth of July by Niraj Chokshi. The New York Times, July 1, 2016. Firework displays are often marred by accidents and injuries—and always have been. Remember, remember Bonfire Night safety warnings: BBC News, November 5, 2014. In the UK, the fire service makes its annual appeal for the sensible use of fireworks. Robots and Fireworks by Evan Ackerman. IEEE Spectrum, July 4, 2012. Robots and drones have fun with fireworks.